I live in an old neighborhood, but a new house. For years I lived in multi-dweling housing which means no fiber for whatever reason. 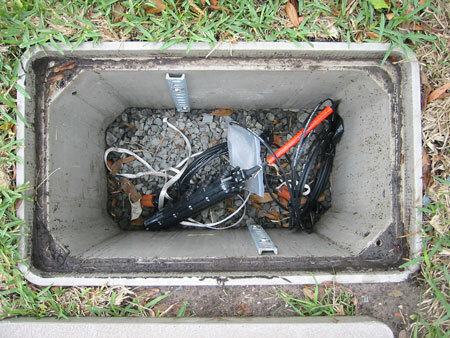 Last year when I moved into an old neighborhood in Tampa I didn’t expect to get FIOS anytime soon. Back in January I noticed they were finally running conduit for fiber on my street, but until today the conduit was empty. Much to my surprise today there was fiber in the box in the front of my house. Who knows how long it will take now for them to light it up, but I can’t wait to get the extra HD channels they provide over Bright House Networks as well as faster broadband, no 15 Mbps isn’t fast enough for me! I had tons of fun at CES with Engadget this year and while I was there taking pictures of HD.net in action they ended up catching me in the action as well. 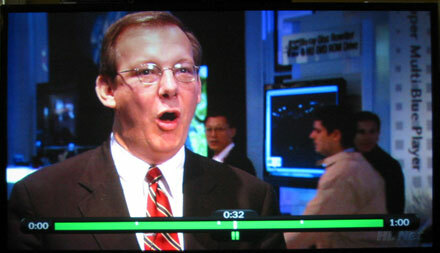 While you can hardly make me out, I assure you it’s me to the right of the guy talking walking by in my khaki jacket. If you want to try to catch it during the “What’s Kwel at CES 2007” fast forward to about the 32 minute mark. As long as I have had my MacBook Pro I have regretted ordering a 120GB 5400rpm drive. I ordered it when the it was first announced, and in my all my excitement I failed to notice the performance difference between 5400rpm and 7200rpm drives. My good friend Frankie quickly pointed it out; no, I didn’t appreciate it. As much as I wanted to swap the drive, I just couldn’t justify it because of the price and the fact that my drive is always full, until recently 160GB 7200rpm drives weren’t even available. I was very excited when I learned that Seagate was releasing a drive for me, only to be disappointed to have to wait to actually receive it. Well the time has finally arrived and it was worth the wait. Anxious to justify my purchase I rebooted and ran back to back XBench tests to get a baseline before swapping in the new drive (more on that later). After following the great disassembly instructions at iFixit and only loosing one screw I used my favorite Linux LiveCD Gentoo to dd the original disc which took just over an hour. 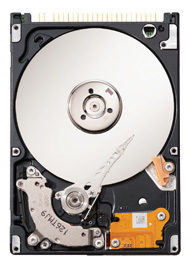 I used the same technique I did for upgrading my Series3, and lucky for me, 2.5″ SATA drives use the same physical interface as the 3.5″ variety. I put everything back together and what do you know, it booted. Just before I got started my friend Ryan reminded me that 7200rpm drives will kill my battery faster than 5400rpm does, thanks for hating on my new purchase! So just after I booted with my new drive and ran XBench a few times, I researched the drives specs and more specifically the power requirements. The original Toshiba MK1234GSX drive averaged 2.5 watts when seeking compared to the Seagate which was 2.3 watts, while the Read/write uses 2.0 watts vs 2.1 watts and lastly the idle/standby: 1.0/0.25 vs 0.8/0.25. So not only is the new drive bigger and faster, but it also uses less power! I ran multiple XBench tests so I took the best from both. Total Disk test results: 30.41 vs 41.86 or 27% increase. Sequential test results: 35.76 vs 89.12 or 60% increase. Random test Results: 26.46 vs 27.35 or 3% increase. My overall XBench score also went from 83.64 to 97.54, which I think makes it well worth the $199 for the new drive, not to mention the additional 37GB of usable space and now I can turn the old 120GB drive into a pocket drive. Ever since I started using a Mac I continue to be surprised when things “Just work”, and today I am writing this with my new EVDO 740 Air card from Verizon. I have been wanting one of these ever since I changed jobs and my new employer supplied me with a phone from Cingular instead of Verizon. Cingular’s voice service is good, but the data leaves alot to be desired. Unlike most of my purchases I didn’t research this as much as I usually do. I was in a pinch and needed to get my Internet fix, previously my research had let me to Sprint, but tonight when I tried to go to the Sprint store they were closed at 7pm, and what do you know, Verizon was just across the street and open till 9pm. After waiting a few minutes Carlos was really helping me out and even got me a discount on the device or $100 instead of $179, no rebates! So I was off, but concerned about activation, as reading that it wasn’t possible to activate on a Mac. Reading the directions on my way home — yes while I was driving — I realized that OS X was supported and when I eventually plugged the ExpressCard in, I was amazed that I was on the internet in less than 2 minutes and all I had to do was insert the card, click ok a few times, followed by my password and finally hit the connect button. All I have to say is WOW! I wish using my XV6700 was that easy. This is my first Verizon service and I am off to a great start, we’ll see how long that lasts. Ohh did I mention it was fast? Is it a sport if there are judges? Most don’t know that I am gear head. I like my cars and I love to drive fast, but this whole drifting thing, a sport? Is ballet a sport? Is anything with judges a sport? Sure sports have referees, umpires etc, but not judges. Sports have defined winners and losers and don’t need judges to tell them who won. Drifting is nothing more than a burn out contest, but the cars move. Sure it looks fun, but not a sport.